NanoStation Loco M2 is a compact outdoor unit which includes 2 x 8 dBi antenna (MIMO) for the 2.4 GHz band. 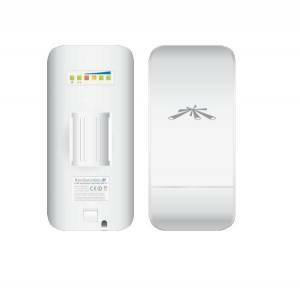 The unit allows real communication speed up to 150 Mbps. more than 300 clients to the unit. This product also has a low latency. processor clocked at 400 MHz and bigger memory. The device supports transparent IPv6 transfers in the bridge and WDS mode. The package also consists of the 24 V PoE power source, which contains a reset button. You can use it for switching the device to the TFTP firmware recovery mode. Another advantage is PoE support on the second Ethernet port for direct supply of another device. This feature can be disabled via the software adjustment.